Sheng S. Li’s calm demeanor may be misleading to observers who are not familiar with his endless list of ongoing projects and responsibilities. During his 32 years at UF, Li has created and maintained a distinguished record of service and achievement in graduate education and research. The contents of a single manila envelope on Li’s desk represent the culmination of 10 years of dedicated research. The signatures on this long-awaited contract seal a 3-year agreement with the United States Army that will guarantee the future of Li’s research into quantum well infrared photodetectors (QWIP). These high-performance infrared photodetectors can use heat to pinpoint two targets simultaneously – making this research of primary interest to the military. Though he appreciates the government’s interest and funding, Li hopes his findings will eventually benefit the public more directly. At the recent QWIP 2000 Workshop, several companies addressed the various military and commercial applications of QWIP. For his part, Li observes that the reemergence of infrared technology using highly sensitive QWIP could provide a new and effective diagnostic tool for medical imaging of cancers and other diseases. Possibly the most imposing task at hand for Li is a proposal for a program that includes UF among five universities from around the nation taking part in the Multi-University Research Initiative. The $4.5 million project would fund further investigation and production of infrared detectors and help train students as future engineers in this field. In addition to his work on QWIP, Li has collaborated with several colleagues in the development of low-cost solar cells. Scientifically known as thin-film CulnSe2 (CIS), these cells rival more expensive silicon cells for generating solar power. With the public’s growing concern over oil prices, the CIS thin-film solar cell research is attracting the attention of industry as a cost-effective energy alternative for the future. 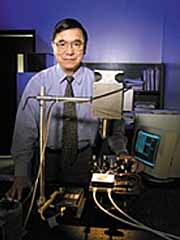 Li has a history of research in semiconductor materials and devices that has been cited as “innovative.” His work has resulted in more than 60 papers on the subject of QWIP and more than 100 refereed journal and conference papers. His studies have built a foundation that has led to UF’s widespread recognition as the prime research institution in this field.